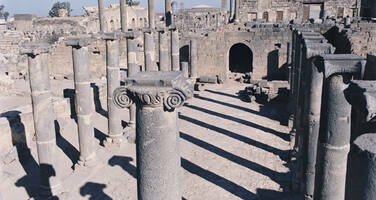 On 14 January 2015, the State Party submitted a state of conservation report for the six World Heritage properties in Syria, and on 9 April 2015 an update on the Ancient City of Bosra; which are available at https://whc.unesco.org/en/list/22/documents. The January 2015 report indicates that in September 2014, the Directorate General of Antiquities and Museums (DGAM) branch at Bosra was able to access some parts of the property and assessed the veracity of the damages reported in 2014. The State Party reports minor stone collapses at Mabrak Mosque, al-Omari Mosque, Abu al-Fidaa Mosque and al-Fatemi Mosque as well as the collapse of most of the architectural elements in the Kalybe of the ‘Cradle of the King’s Daughter’. It also reports damage from street fights at the monastery of Monk Bahira, the Citadel, Abu al-Fidaa Mosque, al-Fatemi Mosque, and al-Omari Mosque, including damages to its minarets, and in some areas of the ancient city. The State Party further reports damages caused by bulldozers to the Shims Monastery and to the city walls, where illegal buildings have been constructed by local inhabitants. It furthermore indicates illegal excavations in the ancient city and the removal of the water fountain’s bricks at the Manjak Hammam. In addition on 1st December 2014, a massive blast occurred in al-Omari Mosque area, seriously damaging a house. The report finally indicates that the State Party has taken some measures, such as raising awareness among local communities about the importance of cultural heritage, notably to prevent them from using the ancient city for military purposes. In addition to these damages, and to those reported in 2014, satellite images provided in the December 2014 UNITAR/UNOSAT report show moderate damage to the Roman Amphitheatre, the Central Baths and a Roman residence, and also show a 164 m dirt road dug through the south of the amphitheatre although this avoided most of the excavated structures. No further damage is reported in other sources. The April 2015 report indicates that due to the escalation of the conflict, armed groups took control of the property on 25 March 2015; clashes resulted in minor damages to the historical monuments such as al Omari mosque, but the ancient residential units have been severely damaged near al Omari mosque, in the Souq, and to the east of the property; the site museum in the Roman Citadel has also been looted. The State Party indicates that thanks to the cooperation with the local community, an agreement has been reached to freeze combats within the property and allow the DGAM to work on the protection and cleaning of the Citadel and Roman Theatre. The agreement between the parties to the conflict to freeze combats within the property and allow the DGAM professionals to work in the Citadel and Roman Theatre are an important but precarious development which was commended on 2 April 2015 in a statement issued by the UNESCO Director-General. It is recommended that the World Heritage Committee also commend the temporary freezing of combats and request that all efforts be made to ensure that it is maintained.